Courtesy of RE/MAX Alliance-FTC South, Louise Creager. Mountain Living at it’s Best! Sunny Skies show off this Beautiful Southwest Style Insulated Concrete home. Open living space gives charm & warmth to all rooms. Radiant & polished concrete floors further provides easy maintenance & clean living for you. Greenhouse producing lots of tomatoes and other goodies. Garage w/finished space above for artist nook/guest room. No utility bills w/Off-Grid-Solar living! You’ll love how quiet it is living end-of-the road. Call today for your private showing. 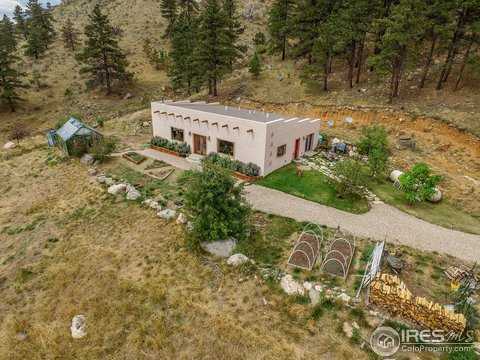 Please, send me more information on this property: MLS# 862889 – $525,000 – 692 Raspberry Gulch Rd, Bellvue, CO 80512. I would like to schedule a showing appointment for this property: MLS# 862889 – $525,000 – 692 Raspberry Gulch Rd, Bellvue, CO 80512.